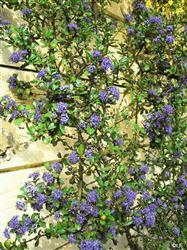 This glorious hybrid Ceanothus is as attractive as it is useful. It has brilliant violet flowers that start to bloom in early spring and small, holly-like leaves. It is very tough, drought tolerant and yet will tolerate heavy, clay soil. For those living in the mountains you'll be happy to note that the deer tend to stay away from this lilac. It is a great option for a hedge or barrier reaching about six feet high and with a similar spread. It will also respond well to pruning for a more formal hedge. Plant this lilac in full sun to appreciate its brilliant blooms at their best.